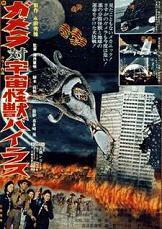 Gamera the Flying Turtle falls under the control of evil aliens, but two children are able to free him so he can destroy the alien ship and to fight the aliens' giant monster squid, Viras. This is the English language version of Gamera vs. Viras (also available here at SSV). Stars Kojiro Hongo, T�ru Takatsuka and Kurl Crane.